Premier Ambrose > Toilet Seat (D Shaped). 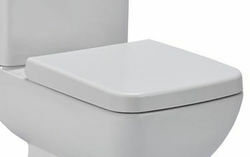 Ambrose luxury toilet seat in white. Premier's Ambrose range of high quality ceramic toilets and basins will add a stylish minimalist square look to your new bathroom suite.